Prime Minister Juri Ratas said that Estonia must strongly consider whether to move forward with the Rail Baltic railway project should the country's share in the project's funding increase proportionally compared to the current rate, reports LETA/BNS. Ratas during question time in parliament on Wednesday said that Estonia must stand to ensure that, when it comes to the Rail Baltic project, the ratio of the European Union financing and Estonia's financing stays at the current level. "This is very strongly connected with the European Union's next budget framework talks for 2021 onwards [until 2027]. It is still a bit difficult to tell today how it will succeed at the end of the day as this has not been agreed on. Estonia is definitely applying for the co-financing ratio to stay the same," he said. At that, the prime minister said that should the financing ratio change, Estonia must seriously consider whether to move on with the project or not. "For example, if the ratio is -- I am just fantasizing right now --, say, that Europe finances 50% and Estonia 50%, then I believe a new decision must be made on whether we will move forward with it or not," Ratas said. He said that the new budget of Rail Baltic has increased by approximately 244 mln euros and based on the current financing scheme, the project has become around 49-50 mln euros more expensive for the Estonian taxpayer. According to the prime minister, the increase in price by around 50 mln euros encompasses the entire construction period. Thus, in the case of a seven-year construction, this means an annual increase of approximately 7 mln euros. At the same time, Ratas emphasized that definitive prices and calculations will be determined when the construction procurements have been carried out. 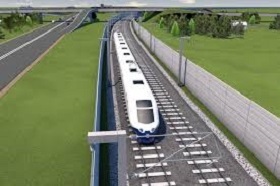 It appears from a preliminary design commissioned by the Estonian Technical Regulatory Authority that the track of the Rail Baltic railway in Estonia will cost 1.6 bln euros, approximately 18% more than according to an initial blueprint commissioned three years ago. Rail Baltic is a double track, European gauge railway for passenger and freight transport to be built from Tallinn to the Lithuanian-Polish border. The railway will have an overall length of 870 kilometers. In Estonia the railway will run south from Tallinn, passing through Harju, Rapla and Parnu counties, before reaching the Estonian-Latvian border. The railway alignment is designed for a maximum speed of 240 kilometers per hour, 120 kilometers per hour for freight trains. The prime ministers of the three Baltic countries on Jan. 31, 2017 signed the Rail Baltic agreement, which sets out the deadlines, the route and several technical details of the new railway interconnection. Rail Baltic Estonia OU is the company to realize the railway project and fulfill the administrative and technical tasks concerning the project in Estonia.